Facebook has introduced trimmed down interface version “Facebook Lite”. It has basic features of Facebook and loads very quickly. 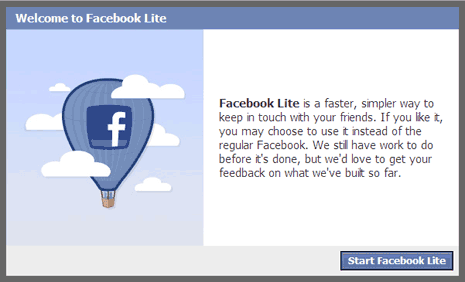 So, if you are a Facebook addict with slow internet connection – Facebook Lite interface is for you. It has 2 column interface (unlike 3 columns of Facebook) which loads very quickly. Instead of going to Facebook.com, goto http://lite.facebook.com/and login. You will see neat and more readable Facebook interface minus irritating applications announcements like Mafia wars, cards sent etc. Above is visual comparison of Facebook with Facebook Lite. Newer crisp version is ideal to check and post updates on Facebook account without bumping into extra stuff (or crap) presented in Facebook account. Tryout, its fresh and crisp! go to the settings>default site> choose ur option. how cud i go back to my old FB homepage..
n how to disable LITE for permanently…. how 2 view d notifications and news feed on facebook lite? How do I disable facebook Lite? .. It’s highly irritating me.. i can’t even see who all online in facebook .. and i’m not able to view my notifications properly and news feeds also .. Please get me back to old facebook..
same probs, plz help ?? How do I disable facebook Lite? Please get me back to old facebook.